Well, you're going to need something to do in between matches right? Are you as excited about the World Cup as we are? Probably not. We've had our wall chart up for weeks, heavily debated when England will get knocked out of the tournament and are salivating at the prospect of watching back-to-back-to-back matches every day. But what to do in those periods when there isn't a game on? You could go get something to eat – or you could keep that football love-in running. Yes, you can switch on your PS4 or Xbox One and recreate that Spain versus Portugal game on FIFA or Pro Evo. Or you could get that football game fix in the VR realms. Whether you've got a PS VR, a Rift, Vive, Gear VR or even Google Cardboard, there's now a bunch of VR games out there dedicated to the beautiful game and we've played most of them. So we know which ones you should be playing and which to avoid. Whether you call it football or soccer (don't call it soccer), we've picked our favorite VR football games. These are the ones you need to play. There was only going to be one game to go at the top of this list. Prepare to enter the Football Improvement Centre and never want to leave. Headmaster makes great use of the head tracking on the PS VR, Rift and Vive, adding realistic ball physics as you make your way through one ridiculous challenge after the next, heading bowling balls down a bowling alley or at a dart board. It's a firm Wareable favourite and we think you're going to like it as much as we do. If you need a VR game that's about more than heading the ball, CherryPop Games may have the answer you're looking for. Built for the PS VR, Rift and the Vive, VRFC (now rebranded as Football Nation VR 2018) makes use of the accompanying controllers (PlayStation Move controllers for PS VR or Touch controllers for the Rift) to move and the buttons on the controller to shoot. They'll get some getting used to initially, but once you do it's probably the closest you'll get to a full football experience in VR. While there's no single player right now, with all the match time happening in the online multiplayer realms, it does support cross play for PS VR, Rift and Vive making it easier to find other people to play it with. 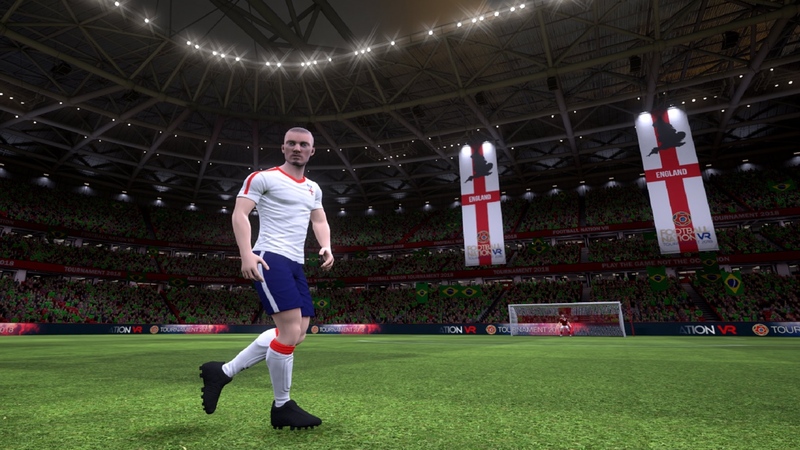 CherryPop has also added a new update that's free and brings a World Cup-style feel to VR. JT's days playing for England are long over, but if you're an aspiring central defender that wants to learn a thing or two about the art from Mr Chelsea, there's a dedicated VR experience that lets you do just that. Terry takes you through training drills, gives you advice on nutrition and will tell you how to keep your body in tip-top shape through a series of 360-degree videos. It's available across multiple VR platforms as well (Cardboard, Daydream, Rift, Oculus Go and Gear VR) so you don't have to spend big if you want to spend some immersive time with the defender. Hands up who wants to be in goal? Final Soccer VR is all about putting you in the firing line using the controllers for the Rift or the Vive to show off your keeping skills. If you happen to have a Vive as well as its new Vive trackers, you can be the one hammering the ball at the keeper, letting you take penalties and free kicks against the man or woman in between the sticks. Just make you have plenty of VR space to make the most of this fine football simulator game. If you don't have the big bucks to spend on a Vive or Rift, the developer behind Final Soccer VR also made a Cardboard-friendly equivalent. As it lacks the body tracking you get with the most expensive VR headsets, you instead use the head tracking to save the ball or direct shots towards the goal. You've got your pick of simply hitting the training field or entering tournament mode where you'll have to float your free-kicks over walls. While it is free, you will have to pay up to progress through the tournament. Another option for the budget VR headset crowd, this is built in the Headmaster mould, albeit with less polished graphics and not so much of those realistic ball physics. Made for Google Cardboard owners, this heading VR game is not going to win any design awards with its cartoony graphics. But it's fun, the heading works well and it's free to play. Last and by no means least is this football VR game for made for the Oculus Rift, Oculus Go, Samsung Gear and Cardboard. Without the recommended VicoVR motion controller or the one you get with the Gear VR, it's all about the heading. Throw in the controller support and you can hammer shots at the keeper as well. Again, the visuals are not the prettiest and the ball physics are not as fluid or smooth as some of the other games on this list, but if you can look beyond that, it's a decent little slice of VR football action.